1. Can you drive? Or do you prefer to ride with someone? What city are you coming from? 2. Avi training? How practiced/capable are you at rescuing someone? 3. How many years downhill skiing? Level of ability? How many years backcountry skiing? See Baldwin's Guide, 3rd Edition, page 207. 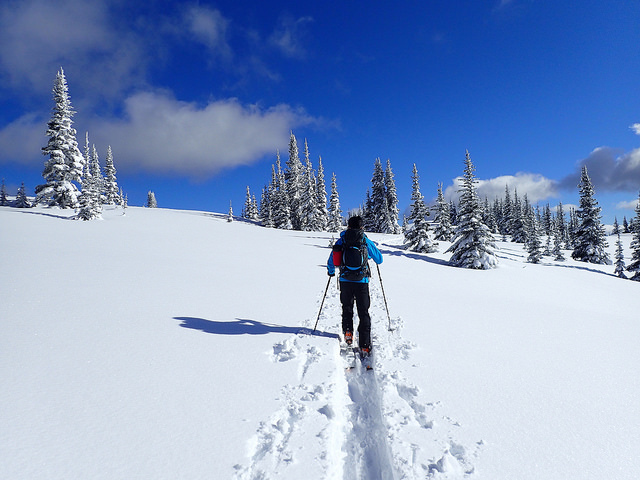 This trip is intended for members who are new to the BCMC and/or new-ish to backcountry skiing. You must be able to downhill ski intermediate or above. Faced with trees or poor conditions you should be able to use survival ski techniques. You must have experience with your backcountry equipment. You must have avi training. This must Not be your first time touring in the backcountry. We hope you enjoy avoiding trees on the ski out :) Not too difficult for an intermediate skier, but they still jump out at you once in a while! We will use the Trip Planning forum for additional information and updates. For last minute questions contact by phone. Gear required: your own 10 essentials. Avi gear (Digital Transceiver, Probe, Shovel). Headlamp suitable for skiing at night. We wear helmets on the downhill. Organizer will bring GPS with tracks; Map and compass; Personal Locator Beacon; Emergency bivy; Tarp and 15m cord; Bone saw; Camera; First aid kit. Recommended carpooling cost: approx. $25 per passenger; please arrange with driver; bring funds. Access to trailhead in Manning Park adjacent to Hwy 3.